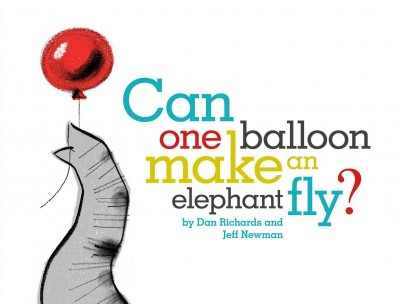 Richards and Newman create an homage to the classic stories of Ezra Jack Keats while creating something completely new and delightful. Newman's evocative charcoal illustrations have thick lines and rich colors and capture the quiet humor of this dual story, while showing a mother who, though distracted, is still paying attention to her imaginative son even if she doesn't fully enter into his creative viewpoint. Not only the illustrations but the whole tenor of a book - the peek into a child's inner life and perspective and a gentle sense of humor - present a story that is sure to be a modern classic comparable to Ezra Jack Keats' stories. 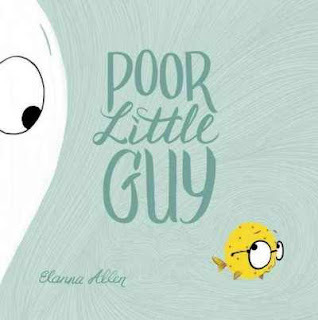 Verdict: A lovely book for storytime or sharing one-on-one. Recommended. I have a weird relationship with history. I'm not going to get into it now, but suffice it to say I am approaching my weeding of the 900s in 2017 with doubt and trepidation. The only thing I'm sure about is that I need more books about historical weapons, the Vietnam War, and updated books on Native Americans. I tackled this new title in the "American Places" series with determination. I have absolutely no interest in reenactments and have never really thought much about such places, but as I was reading this I was pulled in despite my skepticism. It's an interesting story. Rather than focusing on the historical period it brings to life or the modern-day life of people in this historical town, it focuses on the visionary who brought Williamsburg to life, William Goodwin. 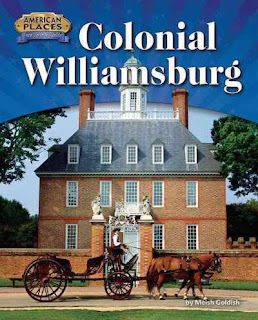 The book covers his dream for Williamsburg, the archaeological and historical investigation that went into recreating the houses and buildings, and how it exists side by side with modern Williamsburg. Maps, statistics, a glossary, and index are all included. Verdict: If you're looking to update your collection in the area of historical landmarks in the US, this looks like an excellent series. It's written in a lively, interesting fashion and there are plenty of photographs and information packed into the slim volume. We had a staff meeting sans director. Pattie had a school function to attend, so we put on a Scholastic movie and left out crafts for the Tiny Tots people. I pulled and packed books, requested books for book clubs, requested books for upcoming programs, and requested more books for school projects as well as working on all the supplies on my desk (getting started on summer). Jess shifted the teen audiobooks upstairs to go with the adult audiobooks and the new chairs came. We can't put them out yet, but they're here. Went through a large stack of new books. It was a very bookish day. I worked on the easy reader project and also reviewed some possibilities for library services to the OPtions group, checked out their facilities, and attended a board meeting. I think we have some good possibilities for collaboration. A large group of very quiet teens inhabited the teen area, which was lovely, as I have a cold and felt miserable. Yes, I had 5 storytimes with a sore throat. Not a fun day. Hardly anyone showed up to the yoga program - it doesn't fit well with our other drop-in activities for Winter Wigglers so we'll probably drop that one. 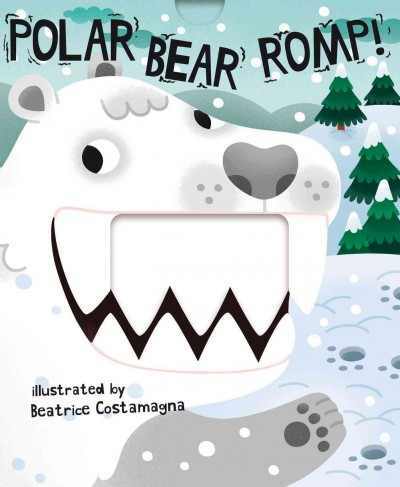 Bear Report by Thyra Heder works really well for teaching kids the difference between fact and fiction. It was a very long day. I came in an hour early to finish the easy reader project. We only had 25 people at Messy Art Club, but the day was no less busy and stressful for that. No programs. I started a new project, weeding the picture books, worked on the lexile lists, cleaned out the stacks of holds on my desk and packed books for teachers, and left at 3pm after all the extra time I've been working. I am glad this week is over. Easy reader project - complete! Grungy copies weeded (we had a book with 165 circs! ), new copies and order lists prepped and ready to send. It's been a while since I reviewed any National Geographic easy readers, but rest assured, I am still buying them diligently! I picked this one up because it was nominated for Cybils. This level one reader has about 8 sections, each a page or two long. They cover general facts about giraffes, their habitats, fun facts, baby giraffes, how they protect themselves from predators, and their food and eating habits. Back matter includes a guessing game with photos of things mentioned in the book, some vocabulary words, and a brief picture glossary. Like all National Geographic titles, this includes vibrant photographs as well as colorful text and backgrounds. Jokes and interesting facts are interspersed throughout the book. 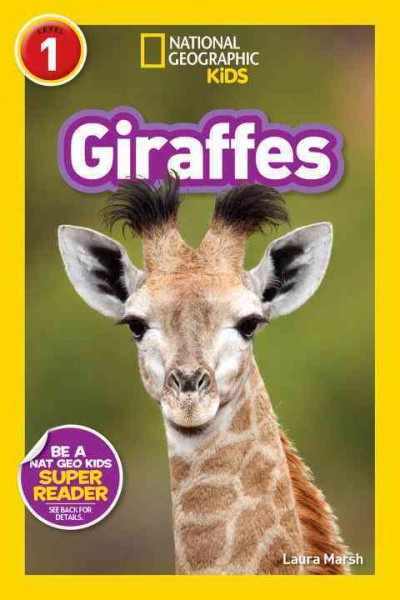 There aren't really any publishers whose levels correspond to actual reading levels used in most schools, but I have a sneaking suspicion National Geographic is worse than most. This level one easy reader has lengthy and sometimes complex text. It's suggested for kids who are beginning to read on their own, but in our leveling system (our school uses Lexiles and we generally look at a variety of sources, including Fountas and Pinnell) it comes in as a level three which is almost an intermediate reader. Verdict: Although the levels tend to be wildly off, these easy readers are still extremely popular with my beginning readers and I'm personally very skeptical about levels anyways. It does help to have a more accurate guide for parents and caregivers, which we do have available in several different forms. Otherwise, this is a fun, well-done easy reader that animal fans will enjoy tackling. 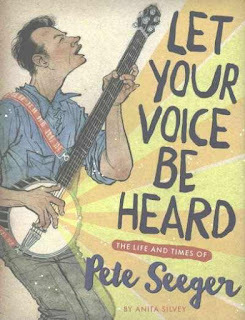 I'm of two minds about this biography of Pete Seeger. On the one hand, it's good. Silvey does an excellent job of taking the reader into the world of Seeger, not only discussing his life and the causes he espoused, but also the formation of the musical movements he was involved in and the wider historical events going on that Seeger affected. She touches on his personal and professional life, covers the effect of HUAC on Seeger's life and that of his family and friends, and talks about his legacy in song, family, and the people he reached through his concerts and life. There are a few black and white photos scattered throughout the book. An afterward discusses the author's own feelings about Seeger and his life. There is also a list of sources, bibliography, and index. So, on the one hand this is a powerful biography of a public figure who, whether or not kids know his name and legacy, is part of the American culture. On the other hand, I have to say that, honestly, the cover is not very appealing. It's difficult to get many kids to read books that are large sections of text with only a few black and white photos to break up the print. Biographies of deceased musicians just don't do well in general in my town (we're not very into the arts scene). I'm also conflicted about Silvey's acknowledgement that she was unable to be neutral as a biographer due to her personal interest in Seeger and feelings about his persecution by HUAC. I have to admit that some of this is my own personal mistrust of anything that feels remotely emotionally manipulative, which makes reading about Seeger's concerts and the responses somewhat cringe-worthy. But apart from my own feelings, I think part of the goal of nonfiction is to teach kids to think critically - and that may be difficult to do in what is, after all, a mostly laudatory biography. Verdict: I'm not sure this is a good fit for my library, mostly because of the lack of interest in the subject. However, if you have kids interested in music and/or activism or want to compare biographies this would make a great choice. This was so perfect and adorable, I can't wait to use it in baby storytime! 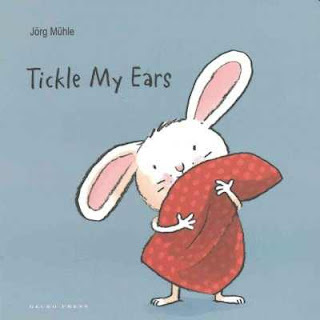 A little rabbit, clad in a blue bathrobe, goes through his night-time rituals with the help of the readers who are invited to clap their hands, fluff his pillow, kiss him goodnight, and pull up the blanket. I loved that this leaves all the actions up to the kids' imagination; it doesn't include any movable parts or pieces. The illustrations are simple and sweet, showing a fluffy white bunny and his night-time accoutrements against a simple beige background.The color scheme is red, blue and white with blushes of pink. Verdict: A perfect bedtime story and also great for leading a baby storytime in simple actions from clapping to a little hopping. Don't forget to pair it with a washcloth bunny rabbit and a felt blankie! Bwa ha ha ha! I laughed until I cried. There is nothing like a good, funny fish story. The endpapers open with swirls of ocean green and a host of white and grouchy fish looming about a poor little yellow fish. Poor little guy, he's grabbed by an octopus, he's just so adorable! 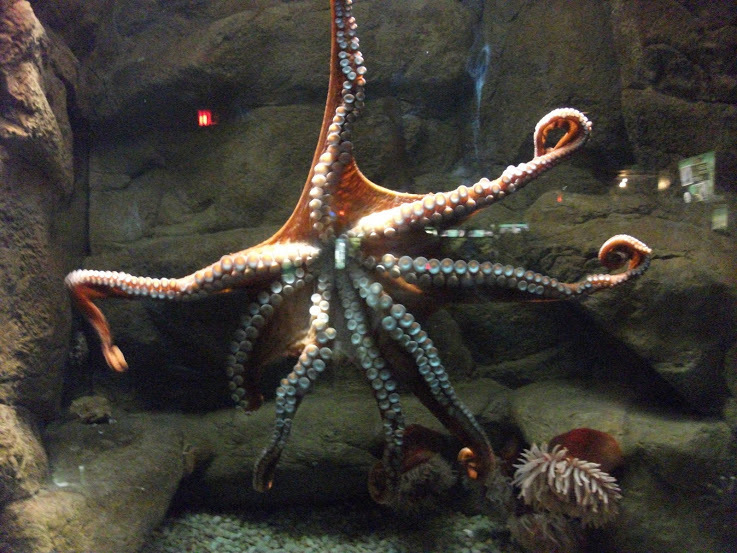 So adorable the octopus wants to eat him up...but this poor little guy has a nasty surprise waiting for his tormentor! Short, sweet, and simple, be ready for waves of delighted laughter when the little fish gets the better of the octopus! The only draw back is the very swirly font is difficult to read, so you might want to practice it before reading aloud. Verdict: Sometimes you just need a funny fish story. This is that story. 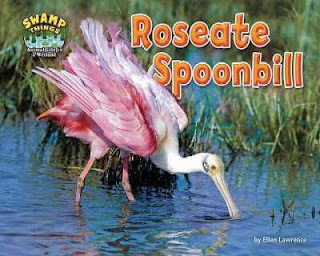 I've previously reviewed a title from Bearport on roseate spoonbills, but this is from a new series, just released in 2016, "Swamp Things: Animal Life in a Wetland." This is a simple introduction to the spoonbill, including its habitat, behavior, mating habits, and predators. Back matter includes a suggestion for a science project comparing birds, a picture glossary, and a page that includes the index, 3 titles for further reading, and a link to the publisher's website. As I'm looking to fill in our animal books, I find fewer titles available at a higher reading level, like the classic Nature's Children titles, but I also find much less call for those titles. I have decided to tell myself that kids are just finding other resources, not that they have lost the ability to read longer, more complex text. Right? Right? In any case, I am dealing with more reluctant and struggling readers at higher ages than my predecessors or even the kids I dealt with 10 years ago. All of which is to say, as I'm in the process of updating our animal books I find myself looking more towards the type of book that Bearport produces; enough text to provide sufficient information, but more photographs than long paragraphs and a layout that does not discourage readers from tackling the book. I also appreciate a wider range of titles on different animals. This series includes titles on alligators, cottonmouth snakes, muskrats, otters, and wood ducks. Verdict: Whether this is a good title and series for your library collection really depends on what you are looking for. If you want a wide variety of titles on different animals and need lower-level books, this is an excellent addition. If you are looking for more reference-type books, this is too brief to be useful. It's what I'm looking for right now, so it's a great series for my library. I'm not wholly convinced that books make a difference in bullying, but I do get asked occasionally (usually for younger stuff, which is a different list) so this is the best I can do. There are a lot more things which could be added to this, and, like all my lists, it's a work in progress. A gloomy day. It was very icy and school was canceled. I came in to work early - I had tried to make it to a visitation for a colleague's husband, but the roads were too bad and work was closer than home. We settled in to our offices and worked since there was really nobody in the library. I was very sweaty. We ordered new furniture for the teen area. Apparently all the schools have stomach flu. Woo. I did bills, cleaned up after yesterday's science mess, and left early. Busy, busy, busy, busy, busy. Easy Readers - weeding in progress. Started work on easy reader section - the giant jump in circulation last year (increase of over 3,000) has had a deteriorating effect on the books and I'm going to be replacing swathes that are torn, stained, scribbled on, or just worn out. I also need additional copies of popular series (I did Elephant & Piggie and Fly Guy last year) and more emergent, low-level readers. Angel in my pocket by Ilene Cooper "It had a very happy ending. I think the angel coin made all the magic happen. There were some sad things, but I didn't cry at all." Hundred Horses by Sarah Lean "I haven't finished it - I'm just to the part where the girls are good friends - but I can't wait to find out what happens. I really like it." Wonderful Wizard of Oz (graphic novel edition by Shanower and Young) "this is one of my favorite books. I like it because it's like the book and it's a comic." Science Comics: Coral Reefs by Maris Wicks "I learned lots of new things about coral reefs and the fish talking were funny. My favorite thing is the disco clam." Thirteenth Princess by Diane Zahler. A long summary of the story was given, which implied enthusiastic devouring of the story. Wonder by R. J. Palacio "You see the story from different perspectives. I think that's the best way to tell a story." This is a new series of beginning chapter, nonfiction books from Animal Planet. The first title is Sharks! and the second is Dinosaurs! Both present a basic overview of the creature, their evolution, habitat and habits, and mentions of scientific discoveries about them. Dinosaurs includes a discussion of fossils and recent discoveries; Sharks covers their endangered status and a brief reference to shark attacks. Both titles include photographs, current news clips, an attractive layout that includes colored borders and additional facts, further resources, glossary, and sources. I'm of two minds about these books. On the one hand, I honestly found them dull. The information was presented reasonably well (although the references to shark attacks were not as clear as they might have been) and there were lots of facts and photographs but the books just didn't catch my interest. In short, I felt that they plodded and I felt the information could have been organized better. On the other hand, I have a strong demand for easier chapter books and there really isn't much in the nonfiction realm for this reading level except National Geographic chapter books. This series is available in both paperback and hardcover and I'm experimenting this year with putting a nonfiction, paperback series into our juvenile series paperbacks (little bee's BlastBack series). Verdict: I'm going to take these to my book club and see what the kids think and see how my one nonfiction series in juvenile series goes this year. Next year I'll decide whether to add these to the collection in hardcover or as a new series. This is a unique and fascinating collection of science and inspiration. There's just one thing about it that bothers me. This compact book with its orange, black and white color scheme quite different from anything I've read recently. It's a collection of facts and information, but more importantly it's a collection of thoughts and ideas. It's divided up into sections like "slow nature thoughts - big, chewy thoughts for your brain" and "slow geology facts - knowledge to help your forehead fossilize." There are also facts about art, space, and the final two pages are designed for you to rest your face whilst considering the thoughts presented in the book. Back matter includes a glossary, acknowledgements (very slow acknowledgements, naturally) and final notes. Funny asides, jokes, and quirky cartoons fill the book with humor and interest and lighten the odd facts and thought prompts. I can see this being a great book for classroom use, discussion prompts for book clubs and car trips, or just to dip into and ponder. There's just one thing that drives me absolutely crazy. The layout. There is absolutely no gutter. In fact, parts of the words disappear into the gutter. I thought maybe the book I'd borrowed had a printing error so I tried another copy - same thing. This doesn't seem to have bothered anyone else, but it drove me insane. See what I mean? WHERE IS THE "T"?? Verdict: A really cool book and if the weird guttering doesn't bother you, have fun with it. Personally, I'll recommend this in ebook format because the gutter issue doesn't show up there. Yes, it's very petty. It REALLY annoyed me but apparently nobody else noticed. little bee tends to not have listed authors for their board books - I assume they're written by an editorial team. Frankly, they're not very good. This series has lengthy, clunky text; "Teddy the polar bear was sad. He felt very alone because nobody wanted to play with him. The Arctic foxes made fun of him for being so big. Teddy felt sad and cried." However, the art and movable aspect of the book makes it pretty awesome. It's a medium-sized rectangle with only five spreads. They alternate between thick, to accommodate the moving parts, and thinner cardboard. The art is a cheerful cartoons with big eyes and splashes of color, even in the white landscape. Of course, the real draw of these books is the teeth! Yes, as you can see on the cover, every alternate page has big teeth that move up and down! The best one is the Dino Chomp! 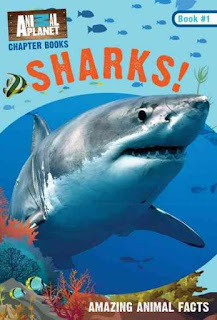 book, but every one is bound to be a winner with the kids who will enthusiastically "chomp" the books until they fall apart! Verdict: Yes, they're totally a novelty, but so fun! Get at least one! It's been many years since I celebrated the pitch-perfect humor of Steve Breen's Stick. Although he's done many things over the years, it's only now that I see, once again, that hilarious sense of humor and perfect timing show up in a picture book again - and this time his art style and writing has developed much further. Benny the woodpecker wants a waffle. He's never had one before, he's not even sure what they are, but they smell oh-so-good and he's willing to do anything to get one. But no matter what clever plans he tries, he just can't get into the diner! Finally, Benny comes up with the most daring, explosive, dramatic plan ever...not to mention the most sneaky! 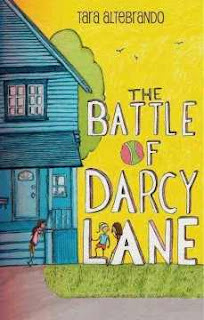 What I loved about this story was not just the surprise ending but that it was funny all the way through, which will hold the attention of kids who haven't developed enough to wait for a punch line. 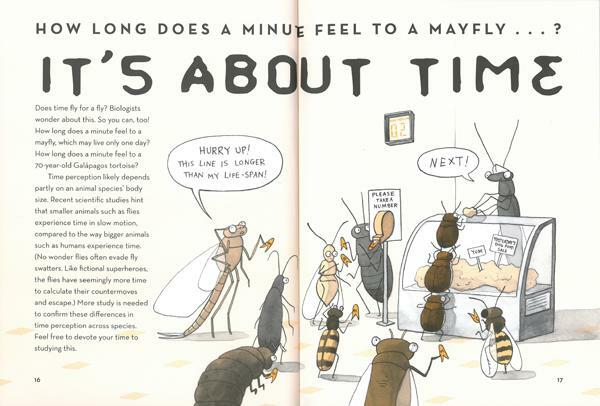 Breen's illustrations are light and cheerful with perky animals and jokes for adults to enjoy as well. 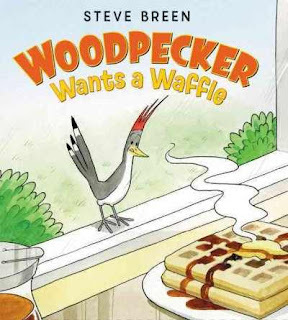 Verdict: Time to start planning those woodpecker and waffle storytimes! This is an addition to a fairly popular series, "Animal Diaries: Life Cycles". This series focuses on the life cycle of an animal, but frames it as a fictional diary of a child. In this title, the child is a boy, Dylan, and he is learning about sea turtles with the help of his older brother. He learns about how they lay their eggs on the beach, what happens when they hatch, and the early life of a sea turtle. The "diary entries" record observations of this process. There are also additional facts included on most pages. 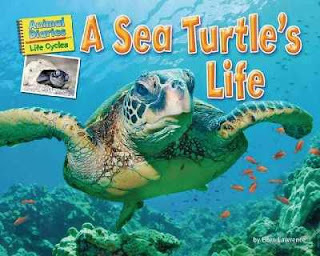 Back matter includes a "science lab" activity - to help save endangered sea turtles by making a poster - a picture glossary, brief index, 3 titles for further reading, and link to the publisher's website for more information. I'm not wholly in love with this format; the mix of fiction and nonfiction makes me uneasy. However, the format works well for kids transitioning to more research-based material as well as giving teachers and students ideas for science projects. I would like to see more science-based activities in the back, especially in this title. Verdict: This series adds variety to my animal section and I will continue purchasing new additions. Our teen area has gone through many, many transformations. Originally, it was upstairs in a small nook. The key advantages of this were the complete lack of supervision, depressing surroundings, and a view into the lobby so patrons entering could be laughed at and/or horrified by teens making out in the windows (I have no idea why, but apparently privacy is no longer a thing). Next, we moved the teens to what was previously the reference room (reference being dead). This was the older part of the library and there was some worry that they would damage the historical part of the building. They didn't (other than discovering that they could climb in and out the windows and throwing various things into the big dish light but that could have happened anywhere). They were closed to the upstairs offices (director and adult services) and the upstairs computer lab. They drove everyone crazy. Conclusion: Teens in the upstairs (quiet) floor is a ridiculous, bad idea. So, we moved the teens downstairs. We've shifted the shelves around several times, as recently as October 2016, but the general arrangement is a long, narrow corridor for quieter studying (and which adults still flock to despite my best efforts) and a wider area for browsing and hanging out. The area is directly next to the children's area and in full view of the youth services desk. Now that we've got the arrangement set, it's time to consider what's in the area itself. This year, thanks to a portion of the budget and a small grant, we're moving towards having a space for programming and hands-on making and activities. I'll be posting more updates as we add to the area, but this is what we're starting with. This is the entrance to the quiet corridor. More YA fiction on the slanted shelf and lots of cool reading suggestion posters by Jess. I've moved the seating around quite a bit here. The computer lab is not movable - the outlets are in the floor - and it basically ruins the whole space. One will go over by the wall, as mentioned before, another will move to the children's area, and the last will go....somewhere else. You can see how the teen area is bordered directly by the children's area. The shelves to the right are new juvenile fiction and nonfiction. The long shelf with a blue display board on the end has manga and anime on the left side and Spanish, Parenting, and holiday books on the right. Pictured standing from the counter. Teen nonfiction, graphic novels (as opposed to manga), audiobooks and magazines on the right. Our counter - it's hard to tell but there are outlets all along the back. The shelf at the end has Boredom Busters - various things for the kids to do. Our two red tractor chairs have lasted YEARS. We bought more and they were absolute crap. We're now looking for bar stools to have seating at the counter. If you walk straight to the right of the teen area, through the nonfiction shelves, you come to the long open space in the children's area. Teens do hang out here too, although I try to keep it mainly for elementary kids. There are two colored tables and chairs (one has moved back and forth from the teen area) and this is where a second computer will be added from the teen area. Caregivers really like this computer as they can keep an eye on their kids at the activity table (it's a science display right now) or playing with the toys. To the right of the activity table is our juvenile audiobooks, toys, and maker kits. There's a reading area on the other side of the shelf, which you can see here. It has a smaller table (which I just moved over) and cushions. Also the kids' magazines and big books. We'll be keeping the teen maker kits (which will only be available for teens!) in a cupboard by the youth services desk for them to check out. I haven't figured out how we'll advertise them or organize them yet - i.e. if I'm doing a program in the teen area I don't want someone to check out the marble run to use. I'm super excited about our new changes and I'm planning a drop-in middle school book club to start next fall! some of the endless baking for the bake sale. Staff meeting and I packed 3 boxes, 5 baskets, and other assorted collections of books for schools! My trusty aide repaired the play kitchen and the duplo table. Sudden avalanche of work and panicked racing to get things done before my outreach tomorrow. Still piles of things on desk. Glitter everywhere (this doesn't actually bother me). Unpacked boxes of books, boxes of supplies, and fought with the copier. Then I went home and mixed masses of caramel and cookie dough for the upcoming bake sale. Remembered why I hate baking. The book & bake sale started today. Lego Club was a bit cramped and we only had tables from the Storyroom. One outreach visit, desk shift, still cleaning off my desk. This week has been very difficult and stressful for everyone and I'm glad it is over. Suicide Squad books - further questions, taken in conjunction with my knowledge of the patron in question - gave them DC Superhero Girls. I will probably buy some Suicide Squad for the teen graphic novels. 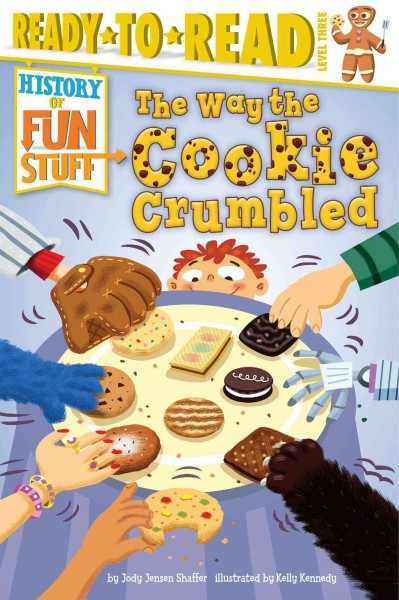 This entry in the "History of Fun Stuff" easy reader series is chock-full of chocolate and other tasty treats (and facts). Who doesn't like a tasty cookie? Or two? Or three? (well, me to be honest - I don't actually like cookies ever since I went on a marathon baking spree back when I was a teenager. *shudder*) Shaffer starts with the evolution of cookies from simple bits of bread and biscuit to the sweet treats we know today. Along the way she adds plenty of interesting facts, from the origin of packed cookies in the Nabisco factory to Queen Elizabeth's habit of eating gingerbread in the shape of her advisors. Back matter includes cookies from several different cultures, the science behind baking, a recipe with extra math, and a fun quiz on the history of cookies. There are no sources listed. Kennedy's illustrations are cheerful cartoons of wide-eyed people throughout the ages, including several different races, all enjoying their sweet treats. The book is listed as a level 3, which for Simon Spotlight means the book is really closer to a beginning chapter book with large paragraphs of text, a clear but smaller font than is normally used in an easy reader, and more complex vocabulary and sentence structure. Verdict: Kids who like fun facts enjoy this series and if you have a need for more upper-level easy readers this is a great series to add. I wouldn't use it for serious research, due to the lack of sources, but kids at this level who need something more challenging to read will enjoy it. I loved Sniffer Dogs by Nancy Castaldo so much - was there anything else to say about dogs and their noses? Absolutely yes! 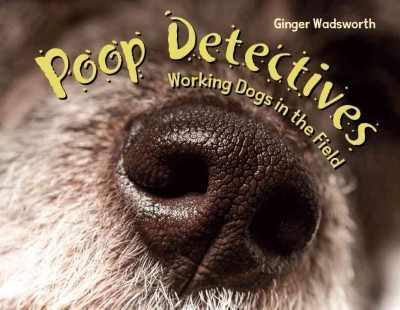 While Sniffer Dogs covers the history and science of dogs and their noses, Poop Detectives gives us an in-depth look at a specific use for dogs; environmental and scientific research! Wadsworth opens the book with a fictional story of the choosing of a good poop detective and then talks about their training and the many uses scientists have found for them, from sniffing for poop to tracking animals, to finding plants! Along the way she profiles various dogs and talks about their unique abilities, training, and how they've helped conservationists and scientists from sniffing out whale poop to discovering turtle nests. The book includes plenty of photographs, sidebars of information, and even a section on the dogs' retirement and life after their working days are over. Back matter includes an author's note, acknowledgements, photo credits, glossary, resources, quotation sources, selected bibliography, and index. Phew! This is clearly a well-researched book and that shows in every lovingly-crafted section. I found myself fascinated by this look at how dogs and humans work together to save and research wildlife and the sidelight on how scientific research changes and adapts. And, of course, there's lots of pictures of poop. Verdict: Don't just hand this to dog lovers - any readers who enjoys science, animals, is thinking about career choices in those areas, or just likes to learn interesting and new things will get caught up in this book. This is definitely going on my booktalk list for next spring and I encourage you to try it out in your book clubs and on your tween readers. Highly recommended. While I fell in love with Spiro's other title, Baby loves Aerospace this one didn't quite hit the spot for me. The titular baby is building a tower with blocks, and Spiro uses this as an example to show how everything in nature, and the universe, is built by quarks, molecules, etc., even baby. The earth-hued illustrations show cute little balls as the quarks which gather together to create all the things in the universe. 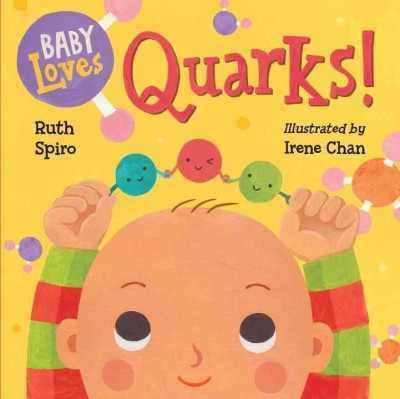 The story ends with scientists smashing an atom and baby smashing a block tower. I felt that this concept was too complex for a board book. It showed the atoms and molecules forming things like oxygen, methane, and water but I don't think kids will understand the idea of gases. Verdict: This was fun, but the concept doesn't work well for the audience and format. If you're buying the whole series go ahead and add it, but it's not a priority. It seems like, more and more, picture books are written for an older audience. Sophisticated art and humor, lengthy text, older protagonists, all point towards a grade school audience. And yet, at the same time, the actual audience for picture books, at least in my library, gets younger and younger. I am therefore thrilled when I find a simple picture book, beautifully illustrated, that has enough depth to catch the eye and interest of older children but also is suitable for our large toddler audience. A thick cover with square die cuts sets the stage for a story that is all about blocks. "Ruby has red blocks." Her bright red shirt and shoes repeat the cheerful red blocks that she builds with. Then along comes Benji in blue socks, blue hoodie, with a blue wagon of blue blocks. Anyone who has dealt with toddlers or preschoolers knows what comes next - "Mine!" and a grand tumble. A little problem-solving and they are ok to play with red AND blue blocks. But what happens when Guy shows up with green blocks....? I loved the blocky illustrations that look like sponge painting or prints. The simple text with clever notes - the alliteration of names and colors, the organization of the blocks, the matching end papers. Most of all, I loved the diversity. 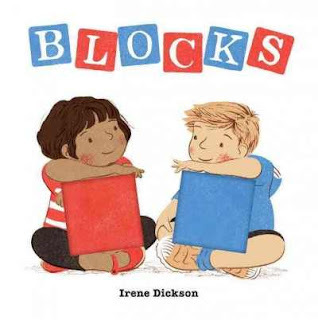 Irene Dickson doesn't just include children of color, she puts them front and center, starting the story with Ruby and giving her equal time with Benji. Verdict: Perfect for reading on school visits, to toddlers, to older children who will pick up the subtle clues in the art, and before block parties. Highly recommended. Today I'm looking at two titles dealing with weather at two different levels. Fog, from the series "Weather Watch" is a Bullfrog book. I put them in picture books, but I frequently recommend them to beginning readers as their simple text and trim size work well for this audience. 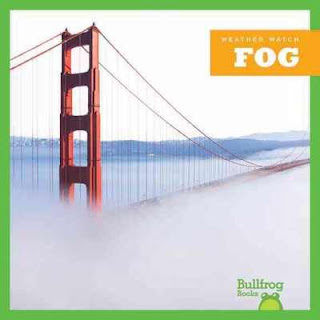 This title uses simple sentences, "Some places are foggier than others. Where? Valleys." to explain where fog is most frequently found and how it is made. A simple index and picture glossary finish out the book. This series includes titles on clouds, lightning, rain, snow, and wind. Weather is always a popular request for teachers and caregivers and kids interested in learning in the world around them will be happy to pick these titles up. Ice Storms, from the series "Disaster Zone" is a Pogo book. I usually place these in juvenile nonfiction as they're aimed at an older audience. This title features photographs, blocks of colored backgrounds, and larger paragraphs of text with more complex vocabulary. This particular title narrates the development and possible consequences of a typical ice storm, explains the science behind the phenomena, and talks about some of the emergency measures needed to handle the storm. 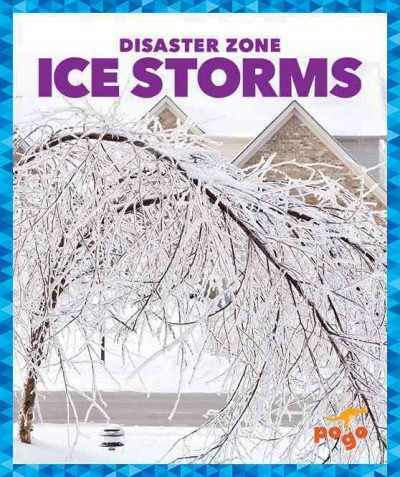 Several disastrous ice storms are referenced and tips for staying safe in a storm are listed. Back matter includes a science activity, glossary, index, and link to the publisher's website for more information. I felt the emergency information given was rather general, but there's not much you can do in an ice storm besides stay home if possible anyways. It's a good level for intermediate readers and is dramatic without being overly graphic or frightening. Verdict: Due to changes in our school's curriculum, I am suddenly in need of a large number of weather books. "Weather Watch" is a good supplementary text if you need additional weather books for a younger audience. "Disaster Zone" is an excellent series to update your older weather selections, especially with current weather disasters. Picture me lovingly unfurling my fronds around my beloved circulation numbers.... ok, that went weird fast. I do like numbers and octopuses though. So, our total children's and young adult circulation for 2016 was 131,770. Those of you doing the math will realize this does not match the collection numbers below exactly - this is because it includes all the holds from other libraries that come in to us. This increased through teacher requests and remote collections this year. This was a total increase of 7,268 from 2015. Board books circulated a total of 3,964. This increased in the fall but was still 251 less than 2015 overall. I hope to continue getting the board books back up to a strong circulation level. The collection increased overall by 112 titles. Children's dvds (which includes blu-ray) circulated a total of 26,807. This was an increase of 130 from 2015. I don't really care, other than feeling that we have too many dvds and it's time to weed. The collection increased by 459 - it's time to weed. Easy Readers (including easy reader tub books) circulated a total of 12,333. This was an increase of 3,143 from 2015. This was our big success and we are THRILLED! Collection increased by 304. I could definitely add more here. Juvenile fiction (including new juvenile fiction and storage) circulated a total of 19,913. This was an increase of 1,641 from 2015. It's hard to measure because this includes several areas, but the collection increased by about 600 I think. With the materials moved into storage, this is manageable. Juvenile nonfiction circulated a total of 7,914. This was an increase of 356 from 2015. Slowly but surely we are working on the promotion of this collection. Some of the materials will never reach the rapid circulation of other areas, but that doesn't mean we can't try! The collection decreased by 471. I haven't replaced as much as I weeded, but clearly that hasn't harmed the circulation. Although we could do better! I need a lot more books here. Picture books (including tub books) circulated a total of 30,164. This was a decrease of 838 from 2015. I'm mainly pleased that the picture book circulation seems to have permanently eclipsed the movies and did not realistically expect the massive numbers of previous years to continue. I do plan to overhaul and update the neighborhoods in 2018 and do a little weeding of some of the more crowded areas, which I think will pull circulation up again. Meanwhile I am focusing on popular titles and subjects needed by teachers this year. Well, that explains why we can't fit anything on the shelves....the collection size increased by 901. I didn't plan to weed next year, but it looks like I will need to do so. Toys (including maker kits and, at the end of the year, audiobook kits) circulated a total of 572. Due to some changes and updates this number isn't wholly accurate, but it's a pretty decent number. The collection decreased by 3 - I deleted a bunch of really ancient toys, removed some from circulation which need repairs/replacements, and had an unfortunately large number stolen. This is not usual! I also added several new things which is why the number stayed fairly steady. Video games circulated a total of 3,255. This was an increase of 138 from 2015. I'm currently facing the slow demise of my wii games and trying to decide how to deal with this. My new collection, anime, circulated a total of 924. My new collection of young adult nonfiction circulated a total of 441. Young adult graphic novels and manga circulated a total of 2,469. This was a decrease of 128 from 2015. I had an increase of only 45. I need to update this collection. Young adult fiction circulated a total of 5,848. This was an increase of 454. Thanks to our last-minute weed, the collection size decreased by 219 but we still had great circulation! Every year I feel like I can improve the record-keeping for the budget. This year I transferred most of my material orders to google sheets, but kept the budget spreadsheet in Excel, which turned out to be a bad decision as there was a gap between the two. $187.27 gap, but who's counting? Next year I've combined all the order lists and record-keeping into the same spreadsheets so I can keep better track. There are always some things you can't predict - Amazon orders, which change their prices, audiobooks with processing fees, etc. - but I think this will give me a closer figure. This year I offered fewer programs for fewer children. But I am ok with this. Really. Ok, mostly. Sometimes I get caught up in numbers. However, over the past few years I've realized that we need to scale back, not just because of staff burnout and what we can reasonably offer, but so that we have adequate time to spend on promoting the collection, outreach, and other duties. Also, as I work to reach different demographics I've found that some groups work better on a smaller scale. Our large, chaotic storytimes are fun, but it's good to have options for families that need something a little more organized and quiet. Smaller groups at book clubs and maker workshops lets me devote more individual time to the working with the kids on developing their skills and interests. I'm not including teen programs here - we only offer a couple teen-specific programs each year, not counting outreach, and that's something we're slowly working on but I don't feel that the numbers are useful at this time. My school colleague offers the bulk of our in-house storytimes, my associate handles most of our teen programming, stealth programming, and assists with outreach (specifically field trips) and I deal primarily with elementary school age programs and preschool outreach. The highest attendance is at our 10am toddler storytime, followed by our baby storytime. The lowest attendance is my We Explore Favorite Artists series, our Mother Goose on the Loose series, and Winter Wigglers series. These also have the fewest actual programs as well. The highest attendance is at our Messy Art Club after school program. The lowest attendance is my two book clubs, Bookaneers and Rock 'n' Read. This week at the library; or, New Year, New Books! Monday we were closed. I delayed programs another week to give us time to thoroughly prep. So we prepped and did many important things. Met with school librarian and then did a super quick promo of books and library services at teacher staff meeting- I promoted several publishers; National Geographic, Charlesbridge, little bee, and Millbrook/Lerner. I got a good response from the resources I sent out - new teacher cards and a big bump in easy reader circ already! Worked on a series of Facebook posts promoting our juvenile series (beginning chapter) books. I plan to schedule them weekly all year. I ordered many things, ranging from books to movies to puppets to supplies. Much discussion of teen area and furniture. I think we have a potential plan! Youth Services Workshop - I have actually found technology I am in favor of adding to the teen area - ozobots and possibly bloxels. Character education books for a beginning reader, turned out to be an adult with developmental difficulties. I gave them our old titles, which I hope to replace soon with new books from Free Spirit. This simple introduction to Dr. Seuss' life is a good choice for beginning and intermediate readers. It starts with Dr. Seuss being awarded the Pulitzer Prize and then jumps back to his childhood experiences. It touches on his love of doodling, wacky inventions, interest in animals, and other events that shaped his life. The second half of the book traces his publishing career from cartoonist to children's author, including his writing habits. It discusses books that changed the way people read, like The Cat in the Hat and titles that had a big effect on popular culture, like How the Grinch stole Christmas! and later titles that focused on conservation and pacifism. The story includes soft watercolors by Johnson and Fancher that show a friendly, but shy man and his quirky creations surrounding him throughout his life. This is a level three title from Step into Reading. They are aimed at grades 1-3, but I find they can cross over into beginning chapter books if needed. It has limited text and plenty of art on each page. I'm gradually being sold on biographies for younger readers (I'm not talking about picture book biographies!) 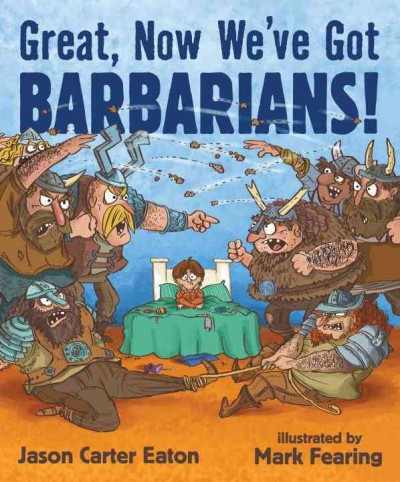 and this one hits all my requirements - a readable font, illustrations, and most importantly, a relevant subject to kids. 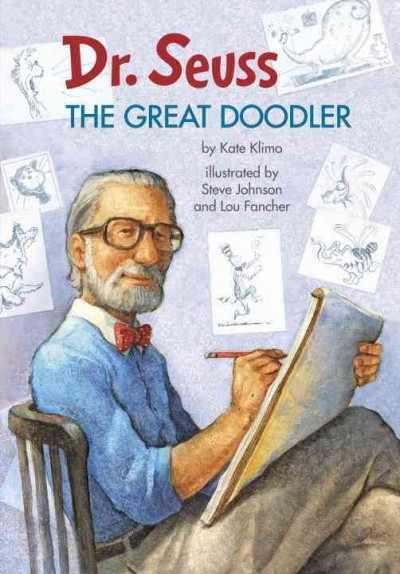 Dr. Seuss' life includes both positives and negatives and Klimo touches on controversies and painful episodes in his life as well as the positive side. Verdict: I'm looking forward to using this in my younger book club, Bookaneers, and I recommend it as a primary purchase for libraries looking to fill in their upper level easy readers. I have never actually read Captain Underpants. So, now you know. I have no real feelings re. potty humor, but the art style isn't really to my taste. 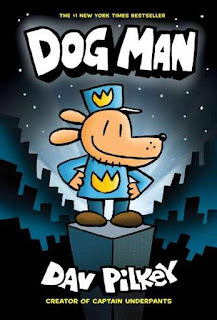 I'm not sure what inspired me to read Dog Man, but I suddenly felt the urge and decided to tackle it. Hmm. Well, it's definitely not something that would appeal to most adult readers. So, this is based on a comic the characters (and author) wrote as a kid. It starts with Officer Knight (who's kind of dumb) and Greg the dog (who's a dog) who have a run-in with Petey the Cat (he's the villain) and a bomb. This results in Dog Man, the best policeman ever! He tackles sinister plans by Petey the Cat and other villains and falls in and out of favor with the chief (depending on whether or not he's recently peed or pooped on the chief's new couch). The art is in color and, like Pilkey's other books, includes flip-o-ramas, dumb jokes, lots of potty humor, and very few female characters (other than the villains). There are also guides to drawing the characters in the back. I can see why kids like these (and parents don't) the humor is gross and exactly the kind of thing kids making their own comics would scribble. The simple art is the kind of thing that adults say "I could draw better!" but kids will delight in emulating. Verdict: Fans of Captain Underpants will be delighted to see this new series. Those who don't care for juvenile and potty humor won't be quite so enthused. The library has something for everyone. Enjoy if it's your thing, skip if it's not. I'm not sure this is, strictly speaking, a board book. It seems to depend on the library. Some put it in board books, some in picture books. In my library, it's in picture books so it stays with the Lola series (Leo is her little brother). It works just as well as a board book though. Leo loves to play in the water and today he is going to baby swim class with daddy. There he and the other babies get to play and splash in the water. It's exciting and fun, but Leo is very sleepy afterward. 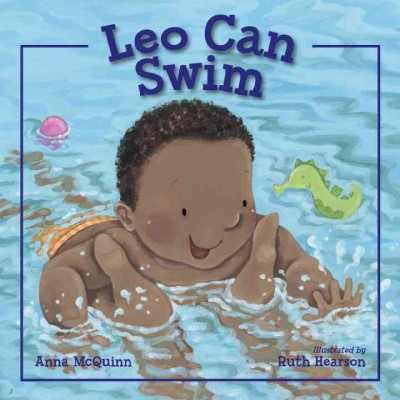 The simple text lists the steps, from swim diaper to holding the rail to splashing, that Leo goes through as he experiences the swimming pool. Complementing the text are the sweet pictures showing an adorably chubby group of babies as well as a broad range of diversity. In addition to African-American Leo and his daddy, there is an Asian father/child pair, a range of body types shown in the moms, and a baby who only has one hand. The book is an 8x8 square with a cardboard cover and thick cardstock pages with a smooth coating to make them easy to clean. So, not a typical board book but not as fragile as a traditional picture book. Verdict: This is a delightful addition to the "first experiences" genre with a much-needed note of diversity. It's wonderful to see non-white families and fathers experiencing childhood moments together. Highly recommended. Eaton, author of the sweet and silly How to train a train pairs of up with wacky Mark Fearing, illustrator of favorites like How Martha saved her parents from green beans and The book that eats people to bring us a wonderfully wacky tale about the importance of cleaning up after yourself. This is awesome. I can't wait to read it, with plenty of expression and silly voices, to kids on my class visits. It's got that perfect tongue-in-cheek humor that will make both first graders and adults snicker at the same time. 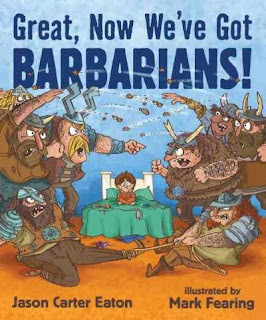 Fearing's silly-gross illustrations show a delightful variety of gruesome barbarians and parents will find the perfect tagline "clean up or we'll get barbarians!" to talk their kids into laughing and being a little more tidy. Verdict: Preorder now. Awesomeness awaits. While I’m generally not a fan of picture book biographies, primarily because they don’t circulate well in my library, I do have space for titles that have something unique to offer. In this book, Annette Bay Pimental explores the life and circumstances of a little-known person who nevertheless had an impact on American history. Tie Sing was an explorer and innovator at a time when Chinese people in America were discriminated against, when most Chinese were restricted to cooking or laundry. He used his cooking skills to become a well-known trail cook and his greatest triumph was working for the Mather expedition, which took a group of men into the mountains and inspired the National Park Service. 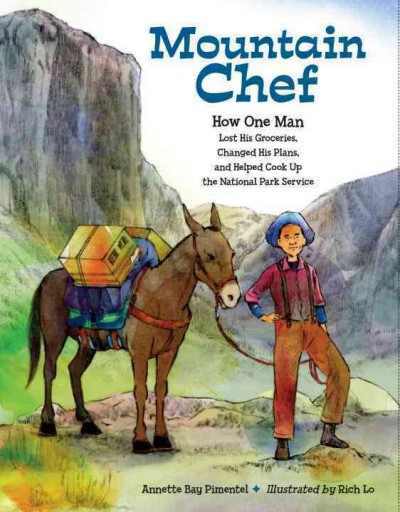 Pimental describes the mountains and especially the food in lush detail, talking about how Tie Sing surmounted difficulties and added his own contribution to encouraging the upkeep and protection of America’s parks. Colorful watercolor illustrations show the men’s excitement and interest in the stunning scenery and Sing’s delicious meals. Back matter includes Pimental’s research into Sing’s life, photographs, and sources. 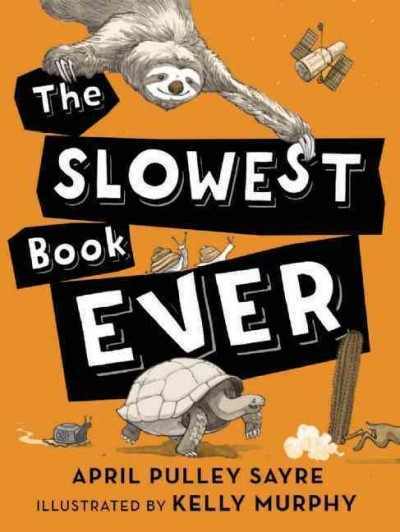 Verdict: Even if you find it hard to move picture books for older readers, I think this one is worth purchasing and promoting to your local schools and homeschoolers, always a good audience for longer picture books. There are very few titles that talk about the contribution of the silent and forgotten members of expeditions, often minorities, and this is an important addition to American history. Ah, let the award posts begin! The official Cybils finalists have been announced! This year I'm concentrating on updating our 900s and filling in missing juvenile fiction series, but I've left some space for award books - especially Cybils! I made detailed spreadsheets of the categories I'm involved in and noted which titles I was purchasing, which I reviewed, etc. as well as diversity and subject-matter. They are a thing of beauty, I assure you. I've also gone through the rest of the finalists and updated my order lists. I don't purchase young adult fiction - I oversee it - so those are mostly recommendations to the selector. This was a new category. I am ambivalent about audiobooks. They tend to sit crammed and messy on the shelf and then suddenly circulate briefly and explosively. I haven't decided what I'm getting next year (if any) but I'll probably go off of this list. Purchased both book and audiobook. Hasn't circ'd much though. Bought it. Loved it. Has some serious fans. Purchased for the library. Has not been as popular as I hoped. I enjoyed the first one personally but didn't think it would circulate. Not owned by my consortium. Probably will not purchase. Maybe. Waiting to see if there's interest. Considering. For some reason my vendor says it's not available until next March. I want to see how her previous books circ'd. Purchased. Very popular this past summer. Purchased. Booktalked. Felt the awesome. First volume in adult graphic novels.